Our highly-skilled journeymen toolmakers are committed to the manufacture of dies of the highest quality, and their careful attention to detail means every part in every die is made right. In addition to our highly-engineered tools, we offer custom and production machining that encompasses a wide range of processes including: Wire EDM, CNC, and Grinding. 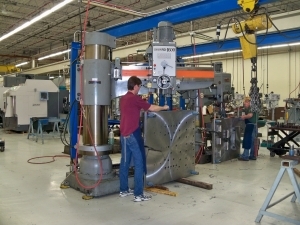 Jonesboro Tool & Die Company has punch press capacities from 25 to 400 tons and is prepared to offer its stamping facilities for short or long runs, using an existing or custom-built die. We have a engineering staff with the experience and technical knowledge to deliver designs that meet your needs. Whether it be a die, fixture, or special tooling, our staff can create it. DEDICATED TO THE MANUFACTURE OF PRECISION DIES, FIXTURES, AND SPECIAL TOOLS, WHILE OFFERING CUSTOM AND PRODUCTION MACHINING AS WELL AS PRODUCTION STAMPING. Welcome to Jonesboro Tool & Die! OUR ENGINEERING, TOOLMAKING, AND QUALITY CONTROL PERSONNEL ARE COMMITTED TO DESIGNING AND PRODUCING TOOLS WITH THE HIGHEST STANDARDS OF WORKMANSHIP AND ACCURACY POSSIBLE. Located in the Jonesboro Industrial Park on the south side of Jonesboro, Arkansas, we are ¾ mile from US Highway 63, about an hour from Memphis, Tennessee. Our state-of-the-art facility is 55,000 square foot. From part print to finished product, Jonesboro Tool and Die Company has the skills and equipment to do your job right. Allow us to quote your next tool package. We will deliver a quality tool at a competitive price. At Jonesboro Tool and Die Company, Inc., our success rests upon the backs of our machinists and toolmakers. They truly bring every tool to life with a skill set and knowledge base that combines mathematical precision with artistry. If you have a custom machining job, please visit our equipment list to see if we have the capabilities required. If you are unsure, we would be happy to answer any questions you have and provide you with a quote. Modern machining equipment works in multiple axes, and to accommodate the seamless transition between design and manufacture, Jonesboro Tool and Die Company, Inc. has recently invested in a new 3D design package. 2012 was a year of change for Jonesboro Tool and Die Company, Inc.
We have been working hard to improve the web experience our site visitors, current customers, and potential customers have when using our site.